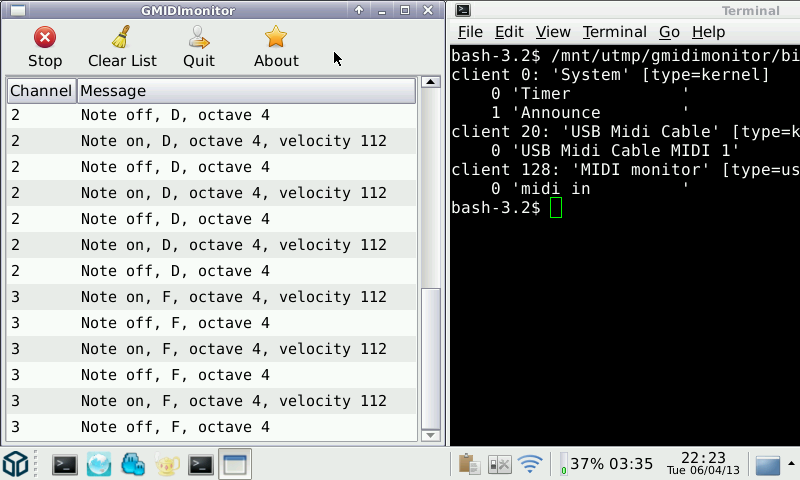 GMIDImonitor is a GTK+ application that shows MIDI events. This app can be used i.e. for tracing the MIDI signals in your complex MIDI HW studio. Seeing the type of data coming in from outputs can help you solve puzzled or wrong routing. To use this tool successfully you need to connect it via ALSA MIDI routing (a.k.a. ALSA sequencer). As there is no ALSA patchbay available for Pandora yet you need to use aconnect. It is contained in this PND for your convenience but you can also install it form Angstrom repo into NAND (it's just about 6kB). After you launch the PND you'll be instructed on how to connect the app to your MIDI source.